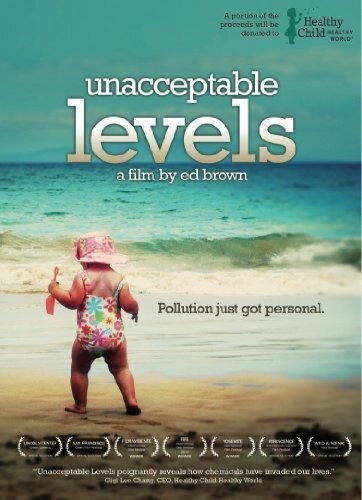 UNACCEPTABLE LEVELS, an acclaimed, award-winner at the Yosemite, Filmambiente and Fife International Film Festivals, examines the results of the chemical revolution of the 1940s through the eyes of first-time filmmaker Ed Brown, a father seeking to understand the world in which he and his wife are raising their children. To create this documentary, one man (Brown) and his camera traveled extensively to interview top minds in the fields of science, advocacy, and law, including influential author and gadfly Ralph Nader; Dr. Devra Lee Davis, Founder of The Environmental Health Trust; Andy Igrejas, Director of Safer Chemicals, Healthy Families; and Dr. Jennifer Sass, Senior Scientist with Natural Resources Defense Council, among many others. Weaving their eye-opening testimonies into a compelling - and sometimes frightening - narrative, Brown unspools the story of how the chemical revolution brought us to where we are, and to where, if we're not vigilant, it may take us. Posing challenges to our companies, our government, and our society to do something about a nearly-unseen threat, UNACCEPTABLE LEVELSopens the door to conversations about the ever-present chemical burdens we face so that we can all make informed decisions on how we live, now and in the future. *	Ralph Nader, Author, "Getting Steamed to Overcome Corporatism"
*	Christopher Gavigan, Past CEO, Healthy Child Healthy World; CPO, The Honest Co.
*	Dr. Alan Greene, Pediatrician, Author, "Feeding Baby Green"
*	Dr. William Hirzy, Fluoride Action Network; Former Chemist in Residence, American U. New York City-based TDC Entertainment is a diversified home entertainment distributor headed by longtime industry veterans Gary Baddeley and Dan Gurlitz. TDC combines the distinctive film collections of three label imprints: disinformation(R), True Mind and Shelter Island. With a focus on films that cover social, political and environmental issues, as well as subjects that range from ethics and health to personal growth and history, TDC's highly acclaimed library of films includes Robert Greenwald's political documentaries such as Unmanned: America's Drone Wars, Wal-Mart: The High Cost of Low Wages and Outfoxed, the Emmy(R)-winning PBS series Journey of the Universe, compelling issues-oriented docs Tapped, Killer at Large, Greedy Lying Bastards and Vanishing of the Bees, as well as the best-selling Parents Choice Award-winning instructional series, Drawing with Mark. For more information, visit TDCent.com.